The US Navy Surface Warfare in Panama City, FL needed a maintenance building for a new tank that they are testing for amphibious operations. This fabric structure shelter is near the water and allows them to do trial runs, bring it on ground, work on it, and put it back in the water, all in record time. This fabric building also has lights and air conditioning. This design was a first for Shelter Structures, a triple wide shelter designed to maximize tarmac space for NAS Meridian. After successful completion of the project in 2006, Shelter Structures was invited back and challenged to provide cover for 54 aircrafts. 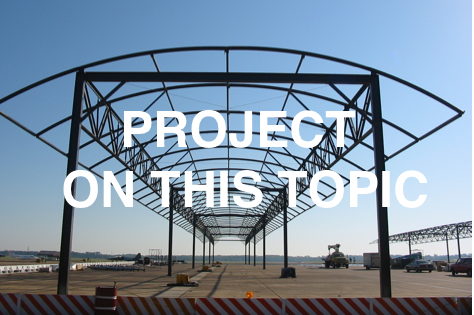 Shelter Structures then designed an additional 18 triple wide canopies allowing three aircrafts per structure reducing costs and their footprint on the tarmac. Shelter Structures worked together with a local contractor in Kuwait to put together the winning competitive bid to build this 150′ W x 130’L x 46′ H building. It was erected in Kuwait to support the USAF operations in Iraq. 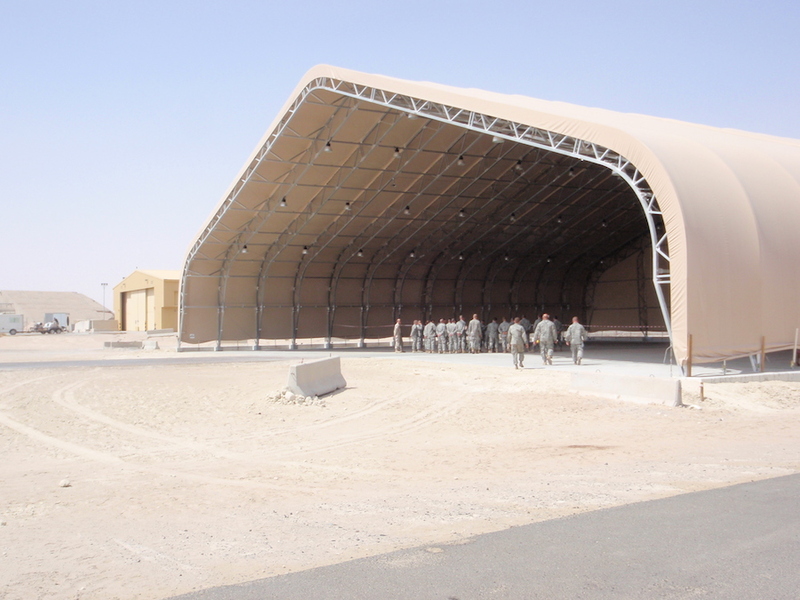 The United States Air Force called upon Shelter Structures to help them them deal with the extreme heat and UV conditions at the Cannon Air Force Base in New Mexico. The structures also needed to be able to withstand winds. A galvanized MQ frame was used to successfully resist winds, as well as provide UV protection. Shelter Structures completed a much sought after hybrid building. Designed at the request of the 75th Ranger Regiment at Ft. Benning, GA, this building includes a metal hard-side for added durability, and industrial composite flooring, extending the life of an old asphalt pad. Our standard 20oz translucent PVC fabric building roofing provides natural light, and this hybrid fabric structure building can be erected anywhere. Any height, any length, any width. When the Army need additional training space for our troops, they turned to Shelter Structures, Inc. This fabric building was erected in Ft. Gordon, GA. Shelter Structures specializes in portable structures which can be moved to any site on the base. The Naval Air Stations at Kingsville, TX and Meridian, Ms each ordered 16 aircraft hangars to protect their T-45 Goshawk trainers. The hangars will lower the cockpit temperatures by 80 degrees in the summer, and are built to withstand winds of 130 mph.